St.Ives Man – One of a series of cast concrete bus stop markers commissioned for The Cambridge guided bus way. Positioned at the St.Ives bus stop, this angry looking face is based on a Bellamine face jug displayed in St.Ives Norris Museum. One of the flagstones has a data stick embedded inside, acting as a time capsule. Another has a capsule buried beneath it containing many of the local communities thoughts, opinions, fears and hopes about the new bus way. Cambridge Guided Busway workers install one of the cast concrete paving slabs made for three of the stops. On 17th September, 1621, Cardinal Robert Bellarmine died. He was a Jesuit theologian who was famous for writng books arguing against Protestantism and criticising King James I. Bellarmine even forced Galileo to renounce his idea that the earth revolved around the sun! He was made a saint in 1930. But Bellarmine was an unpopular man and is remembered in museum circles for a completely different reason. At the time of his death, the German town of Frechen, near Cologne, was famous for producing pottery jugs with the fierce face of a bearded man moulded on the neck. The Dutch and English Protestants who had long been in dispute with the Cardinal thought that the ugly jugs with their fat bodies and frowning bearded faces, offered the perfect caricature of their old enemy. They were nicknamed Bellarmine Jugs and have been referred to as such ever since. Bellarmine jugs had a special use in the 17th and 18th centuries, especially in Huntingdonshire where the notorious case of the ‘Witches of Warboys’ meant that a belief in witches had lingered for a very long time. The Bellarmine’s fierce face and salted glaze was believed to scare and protect against evil. One of these jugs was found buried under the hearth of Pond Cottage at Wennington, near Abbots Ripton. The late Mrs Alice Bannister, whose mother found it in 1914, gave it to the Norris Museum and we have it on display. After 300 years of stopping witches coming down the chimney at Pond Cottage, it is now protecting the Norris. It seems to have worked so far!! 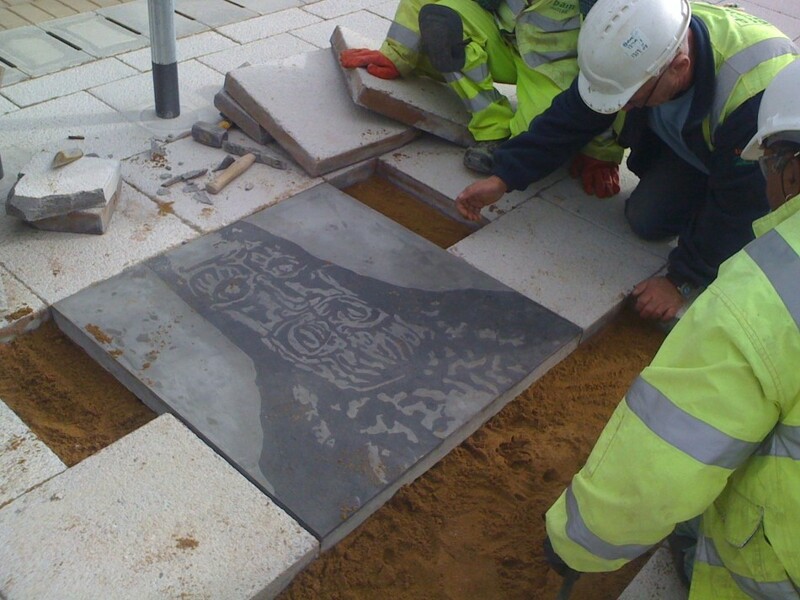 February 6, 2012 | Filed under Commissions, Uncategorized and tagged with cambridge busway, commission, concrete, drawing, green man.